Spiritually mature and zealous faithful, active in lay organizations, promoting human development rooted in inculturation, supporting one another, evangelizing through witness of saints and missionary priests in unity, love and dignity. The opening of the new State Hospital led to the introduction of the Sisters who arrived on February 26, 1916 from Italy.They belong toReligious Congregation of Sisters of Maria Bambina and at the request of Msgr. Erminio Bonetta(PIME), they were employed to work in the Hospital. They did wonderful work. They opened an orphanage. In 1919 Bishop Sagrada (PIME) visited the mission and found it solidly established. A Leper Colony was opened in 1945. The third mission station was opened at Mong Lain, 80 miles south on the road to Thailand in 1924. Mong Yang was opened. Then a famine occured that same year and the charity and the sympathy of the missionaries contributed to the conversion of 150 families. In 1929, the Sisters of Charity were asked to take charge of the Civil Hospital in Loimwe, 18 miles south of Kengtung (Kyaingtong), the 5th station was thus opened. Mong Yong and Mong Phyak were opened. Catechumens numbered seven thousand. Temporary buildings were replaced; schools were progressing and the Sisters were doing a fine job among the sick and lepers. In 1938, the mission opened its own hospital at Mong Lin. In 1939, Seminary was opened in Kengtung (Kyaingtong). In 1940 there were 24 priests. The Italian priests were interned by the British, some in India others in Myanmar during the World War II. Under the Japanese, they were kept at Kalaw. After the Japanese invasion, the missionaries were allowed to return to their places. Msgr. Erminio Bonetta(PIME), due to ill treatment of Japs, lost the sight of one eye. He went to Italy for medical treatment in 1947 and returned on the following year with six new missionaries. On a trip to Mong Phyak and Mong Yong on a salt laiden truck, the driver lost control of his vehicle on the deep descent. Msgr. Bonetta (PIME) and an old woman were pinned under the truck and killed instantly. 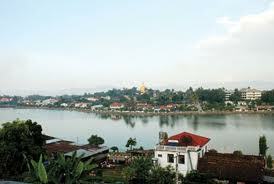 In May 1950, Kengtung (Kyaingtong) was raised to that of a Vicariate and Msgr. Ferdinando Guercilena(PIME) was chosen as its first Vicar. He visited Italy for the first time in 24 years and was consecrated in his native village of Montodine, Diocese of Crema, on October 8, 1950. He returned to Kengtung on the following year.The first prayer book, hymn book and the Life of Christ were published in Lahu language in 1954 and in Akha language in 1955; also in Shan. Fr. Farronato (PIME) was killed by the Nationalist Chinese on his way to visit Catholics. He was buried in Mong Yong by the side of his brother- priest, who had died of black fever in 1926. Fr. Stephen Vong, a local Chinese, educated at the Anglo-Chinese School in Yangon was the first priest of Kengtung (Kyaingtong) Vicariate. He died a martyr in April, 1961. Kengtung (Kyaingtong) on December 19, 1968. He was consecrated at Yado on the 11th May, 1969 by H.E. Bishop Sebastian U Shwe Yauk. H.E. 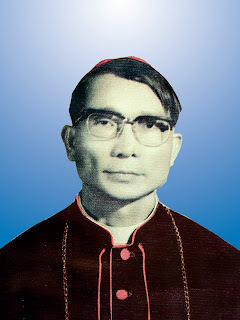 Bishop Abraham Than arrived in Kengtung (Kyaingtong) on the 7th June 1969 and later became the Residential Bishop of Kengtung on the 19th September 1973. He created several new parishes all over such as: Tachileik, Thiri, Mong Khat, Pan Non Lon, Ton Kuam, St. Peter and Kafa parishes. The evangelization in the Myanmar-Chinese border, Special Region No. 4 is the most remarkable achievement in his lifetime. He retired in January 2002. Msgr. Peter Louis Ca Kü consecreted on the 8th December 1997 as Auxiliary Bishop of Kengtung, succeeded Bishop Abraham Than and was installed on January 25, 2002 by H.E. Msgr. Adriano Bernardini, the Apostolic Delegate in Myanmar, in the Immaculate Heart of Mary Cathedral, Kengtung (Kyaingtong).